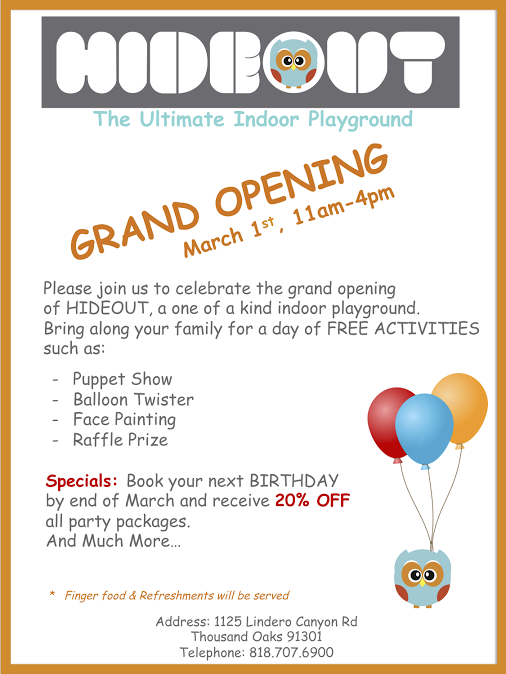 The new Hideout Indoor Playground is opening this Saturday in Thousand Oaks at the North Ranch Pavilion Center, 1125 Lindero Canyon Road, Unit A7. The grand opening event takes place from 11am to 4pm and will feature free activities, raffle prizes, entertainment and refreshments. This brand new facility was custom designed by Sherry Ehya, with a play area that was uniquely designed with a modern tree house, play stage, art studio, indoor climbing area and more. There's also a spacious parent lounge with comfortable seating, TV and free WiFi.